Prosecutors said Tuesday that $35 million in government money had been paid to a consortium of private bus companies in charge of the system, known as the Transurbano, in a deal approved by Mr. Colom, Mr. Fuentes Knight and other ministers without proper legal oversight. Almost a third of the money was spent on equipment that was never used, prosecutors said, and it was unclear how the rest was spent. Rafael Espada, who was Mr. Colom’s vice president, told a local radio station that he had warned the president that the bus project lacked sufficient oversight. “Several of those arrested today have done good things for their country, but anyone who by action or omission has exceeded the law should be responsible for their actions,” said Mr. Espada, who was not among those implicated. Juan Alberto Fuentes Knight, a former Guatemalan finance minister and the chairman of Oxfam International, was also arrested Tuesday in Guatemala City. The arrest of Mr. Fuentes Knight creates a new problem for Oxfam, which has been thrown into turmoil by evidence that some of its aid workers doing earthquake recovery work in Haiti in 2011 had hired prostitutes there. The country director at the time had worked in Chad in 2006, when similar evidence surfaced and no action was taken. Oxfam’s deputy chief executive resigned Monday. In the decade since the Guatemalan government invited the United Nations-backed anti-corruption panel to work alongside the attorney general’s office, a series of investigations have uncovered graft reaching to the top of the political establishment. Former President Alfonso Portillo was accused of embezzling aid from Taiwan and funds from the Defense Ministry. Although he was acquitted at home, he was extradited to the United States, where he admitted to pocketing $2.5 million in bribes from Taiwain for diplomatic recognition. 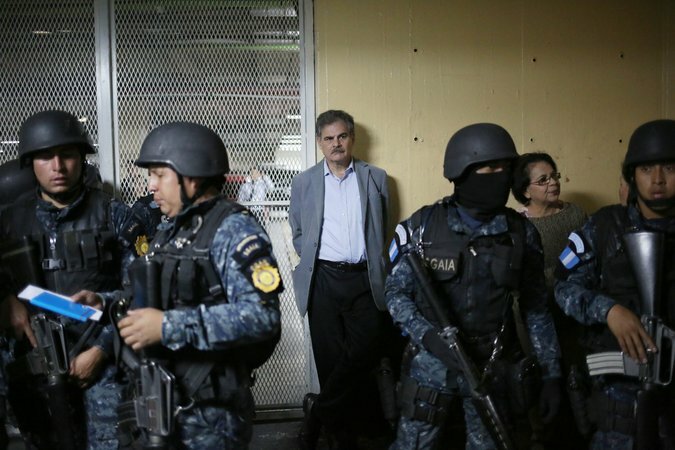 The current mayor of Guatemala City, former President Álvaro Arzú, was charged in October in a case involving contracts with a former army captain who ran an illegal business empire from prison before he was murdered in 2016. And former President Otto Pérez Molina, along with most of his cabinet, is charged in two wide-ranging corruption cases involving customs fraud and campaign financing. He resigned after the first charges prompted Guatemalans to hold months of street protests in 2015. The current president, Jimmy Morales, has clashed with the head of the anti-corruption commission, Ivan Velásquez, over a fraud investigation in which the president’s brother and son have been implicated. Mr. Morales is seeking to remove Mr. Velásquez, but his efforts until now have been blocked by the courts. Through it all, Mr. Colom had remained above the fray and become an elder statesman in Latin America, leading observer missions to monitor regional elections. Two weeks ago, the secretary general of the Organization of American States appointed Mr. Colom to mediate a political crisis in Honduras after contested elections there. Among his tasks in Honduras was to defend a new anti-corruption commission — modeled after the one in Guatemala that has now charged him.